With both magic upgraded, you're ready for Nendoria and the sixth labyrinth. Be warned though, from the sixth labyrinth onward, you'll find monsters that can rust your armor, rendering it completely useless. It's advised to always carry around some Magic Oil. 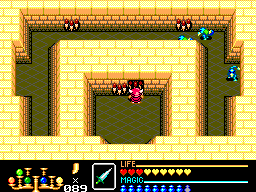 Magic Oil can be found in a chest if you walk into the fireplace in the abandoned house in Kari-Kari, the village of Firewood's desert, or you can buy from shops, but ready your pockets 'cause they're expensive. 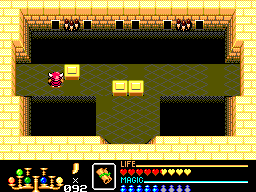 At [14,8], a shop that sells Magic Oil for 90 horns (relatively cheap) appears after you kill all blue globi. 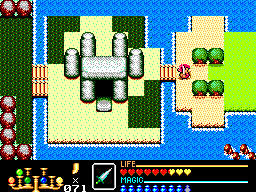 To go the sixth labyrinth, after you cross the bridge between the two continents, keep going south and east until you reach the palace ruins. 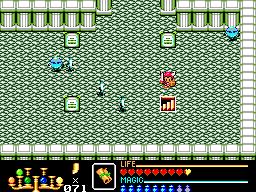 Use the Earth Magic to break the gravestone in the fisrt part of the ruins as shown and a savepoint will appear. Save your game and enter the labyrinth. The first room is cool, just try to stay away from the ugly crabs because they can rust your armor and we don't want that happen. Once you kill all monsters enter the right door. 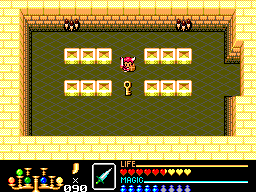 When you get to a room with demons and skeletons, kill all enemies and a key will appear. Get the key and go right. Destroy the right-bottom corner brick and step onto the warp. You'll be teleported to a room full of bizarrians. Kill the bizarrians so they don't bother you again. Go down and kill all enemies. After you pick the key, return to the bizarrians room and enter the door to the right. Push the right torch so the shut doors will open, then go back. Now the doors are open go left and watch out for the crabs! 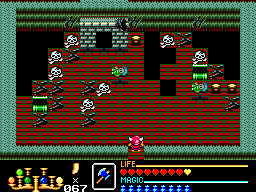 First go down, kill all skeletons and the left door will open. In the next room kill all bats and you'll get a key. 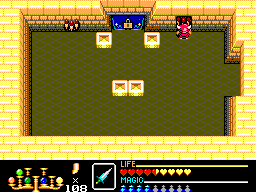 Then go back to the room where the mages were and open the locked door. 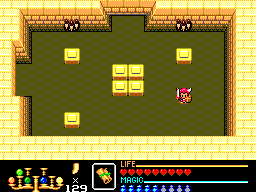 If you're low on life, destroy the yellow bricks at the sides so you can dodge the spikeballs. Follow the way up until you reach the end. Push the right torch and the shut doors on the other side will open. Then go back to the bizarrians room. Once you're back on the first room, go up, kill the eyes if you need, otherwise just dash ahead. Open the locked door and keep walking one way only. 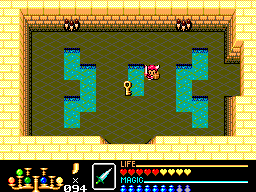 When you get to a room with some mages and some water, kill all monsters to get a key then continue. Destroy the left brick and a path will appear. 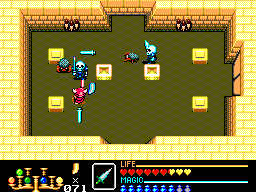 Skip the next room because there are too many monsters, statues shoot and it's hardly worth killing them, unless you get some thrill from the challenge, but anyway. When you get to the room with ghosts, kill them and destroy the leftmost brick to continue. 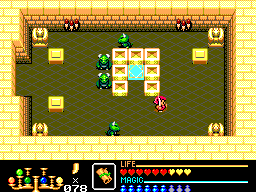 In the next room, you have again to destroy one of the bricks to continue. This time aim for the top-right brick. Go up, kill all enemies and the shut door will open. Enter the left door then go up again and kill all enemies to get another key. Go back and open the locked door then push the right torch on the wall to open a way to the blocked locked door. 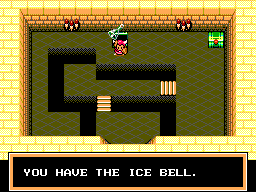 Enter the locked room to get the Ice Bell, but beware the evil chest! (the one on the right) Also watch out for red skeletons. Go all the way back to the room with the remaining locked door. Open the locked door and you'll be at the last room, phew! Almost there. 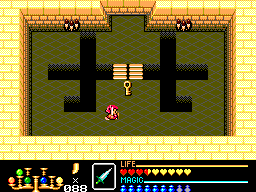 Break the brick as shown in the picture and the door to the boss will open. Make sure you have enough life and magic then get in there. 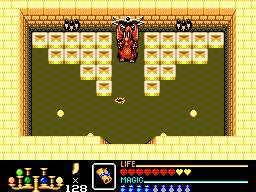 This labyrinth's boss is piece of cake! Stand still at the doorway and use Thunder Magic to hit him. If you don't have enough magic, just attack him and run back to the doorway, be just careful not to leave the room or you'll have to start it all over again. 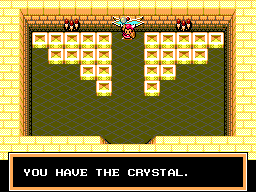 Finally, get the smoke crystal and leave that horrible labyrinth. 4 more to go! 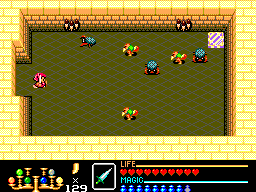 If you follow left, left, up and right, you'll find a shortcut warp that leads you directly to the bizarrians room.